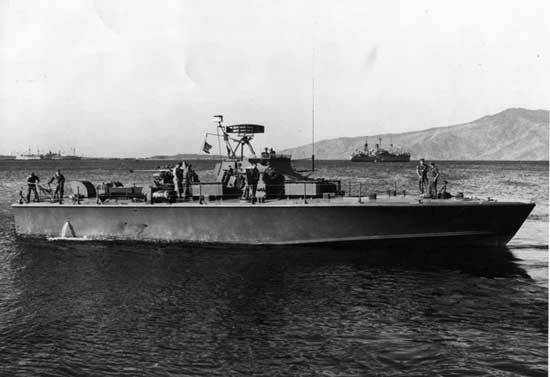 First in the series of U.S. Navy NASTY-class Patrol Torpedo Fast boats, PTF-3 marked the return of the wooden PT Boats to the U.S. Navy. Fourteen of these boats were built in Norway. Commissioned in 1963, PTF-3 was sent to Southeast Asia in the fall of 1963 as a "Spook Boat" operated by MAC V SOG, Maritime Special Operations. PTF 3 along with 5 other PTF boats began raids against North Vietnam by attacking shore installations and inserting special operations teams. It was during a series of raids from 31 July to 4 August 1964 on Hon Mei Island in North Vietnam that the North Vietnamese counter attacked the PTF Boats with their torpedo boats, chasing the PTF Boats away from the coast and into the path of two U.S. Navy destroyers, the USS Maddox and the USS Turner Joy. The ensuing naval battle is known to history as the Tonkin Gulf Incident. Within a week President Lyndon B. Johnson presented the incident to the American people as an unprovoked attack on U.S. naval ships on the high seas. The Congress of the United States passed the Tonkin Gulf Resolution, authorizing President Johnson to escalate what had been a civil war in Southeast Asia into the Vietnam War of 1964-1975. PTF-3 was turned back over to the U.S. Navy in 1965. Based out of Danang, RVN, PTF-3 continued operations against North Vietnam inserting SEAL, Special Forces, Force RECON Marines and South Vietnamese Sea Commando units. PTF-3 participated in the psychological warfare program called the League of the Sacred Sword. A fictitious resistance movement that kept several North Vietnamese Army Divisions busy and out of the war hunting phantom guerrillas. PTF-3 returned to the U.S. in the early 1970's and was stationed at the Navy Diver Training Facility at Key West, FL. Decommissioned in 1977 and sold for scrap in 1978, she was donated to Boy Scout Troop 544 in 2001. With her main engines removed, PTF-3 sat idle for almost 25 years, bouncing from dock to dock in South Florida. 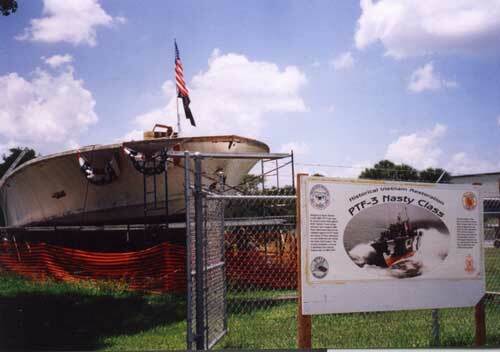 On 25 May 2003, after 30 hours and 250 miles pushed by tug, PTF-3 arrived in Edgewater, Florida. Two weeks later she was lifted from the water, and on 25 July 2003, the 80-foot long, 60-ton vessel was moved overland 43 miles to the Deland Naval Air Station Museum for a restoration program.